Excesses are signs of economic tops. They readily appear in stocks, real estate, and art. If inflation is running amuck, gold and silver can see excesses. Right now, though, we can be certain that there are no excesses in the metals. Stocks are just off their all-time highs, and stock perma-bulls are confident that continuing to “buy the dips” is the right strategy. Yet stocks have not topped their January highs and the moving averages (MAs) are starting to converge. If the 50-day MA drops through the 200-day MA, that is the “death cross,” which often has signaled the end of stock bull markets. 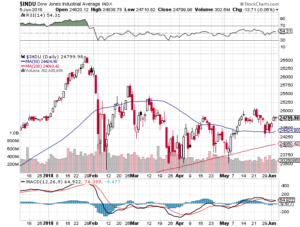 In March, the spread between the 50-day MA and the 200-day MA on the Dow Jones Industrials exceeded 1,750 points. Now, the spread has narrowed to less than 400 points. The death cross usually sets off selling by investors who follow technical indicators. Tesla, Amazon and Netflix are examples of excesses, with their stocks trading on exuberance, not projected earnings and future dividends. At the 2000 top, Microsoft, Intel, Cisco and Dell were dubbed “The Four Horsemen,” as they drove stock averages higher. Yet in today’s market, The Four Horsemen are hobbled, not having reached the market valuations that they had in 2000 despite having earnings that are multiples of their 2000 earnings. Although secondary home sales nationwide in April were down 1.5%, the real estate market is hot. The Arizona Republic recently carried this headline: “Multi-million-dollar home sales soaring.” It noted that in “The Valley,” where Phoenix sits, “The number of houses selling for $3 million or more has doubled,” with a home having sold for $15.65 million, a record for The Valley. In June, medium home prices are likely to exceed the June 2006 record price of $264,800. On Lake Oswego in Oregon, lake houses are being bought for $3 to $5 million and being razed so that even more expensive homes could be built. In Jackson, WY (population 12,000), some fifteen houses in Jackson are for sale at asking prices of $3 million each and a few in the $10 million range. In Telluride, CO, basically a ski resort town, condos are offered for $2 to $8 million. In the major cities around the world, New York, London, Hong Kong, etc., condos and “flats” have sold at record prices. A London “flat” tops the list at £140 million ($185 million). The art world is even crazier. A painting by Jean-Michel Basquiat, a name that most readers will not recognize as I did not, sold for $110.5 million at a Sotheby’s auction last year, setting a record for an American artist. The artwork, titled “Untitled,” was unknown before being displayed only weeks before the auction. It was painted in 1982 and sold at auction in 1984 for $19,000. So, we’re not talking about an “old master’s work.” Basquiat started as a graffiti artist and became “world famous” in his ’20s. He died of a drug overdose at age 27. Classic artwork sales have been even more impressive. In May, David Rockefeller’s art collection, some 1500 pieces, took nearly two weeks to sell and reached $832,573,469, nearly doubling the previous record held by the sale of the Yves Saint Laurent collection, which totaled $443 million. The current record for a single painting goes to the Leonardo da Vinci Salvator Mundi, which sold late last year in a New York Christie’s auction for $450,312,500. On a recent trip to Central America, I noted two examples of excesses. 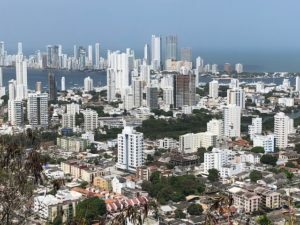 In Cartagena, Columbia I took the photo below. The photo below was taken in Curacao. 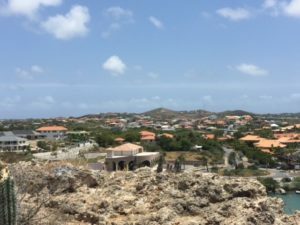 “Fifteen years ago,” the guide said, “no houses could be seen from here.” In Cartagena, the excesses were by investors; in Curacao, by individuals. In the first game of this year’s NBA Championship playoff, court side seats reportedly were priced at $23,000 each and were resold for $70,000. Excesses always occur at economic tops, and those excesses are not limited to the wealthy. Ordinary people forget the value of money; they forget their struggles of only a few years earlier; they eat out more often; they buy higher-price homes, autos and clothes; they pay little attention to interest rates; credit card debt goes up. Sales of expensive, low-mileage pick-up trucks and SUVs are going so well that several car manufacturers have openly discussed abandoning making sedans. There is no doubt that today’s “wealth effect” is greatly influenced by the massive quantities of money that central banks have created since 2008. Now, though, the Fed, which led the central bank printing coming out of the 2008 World Financial Crisis, has stopped adding to its “holdings” and is even selling assets, draining money from the financial system. The Fed is also raising interest rates. An economic slowdown cannot be far behind. Then there will be a rush to safe havens, and gold and silver will again be the hot topics on financial channels as prices move higher. Moving from high-priced investments to under-valued assets has long been a money-making strategy. Investors holding assets that are highly-valued, should consider selling and transferring those funds to under-valued gold and silver. How’s this for another excess at the top? A 1963 Ferrari GTO just sold for $70 million, believed to be the highest price ever paid for a car. One of only 36 that were made, it sold in a private deal to David MacNeil, the founder of WeatherTech, the maker of car floor mats. Previously the highest price for a car was $52 million, paid for another 1963 Ferrari GTO in 2013.